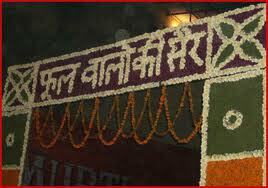 Sair fair will Celebrated on Sapetember Month Every Year. The Sair Fair is celebrated at Shimla in Himachal Pradesh, India. 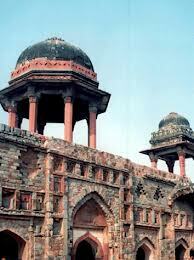 It is an extremely popular fair of the area and brings lots of liveliness and fun along with it. 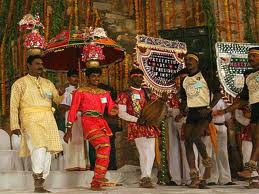 The Shimla Sair festival ofHimachal Pradesh is celebrated with extreme enthusiasm in the month of September. 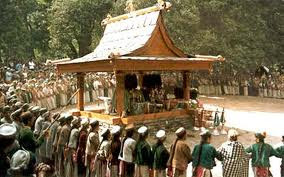 Himachal Pradesh is already very famous in terms of its culture, fairs and festivals. 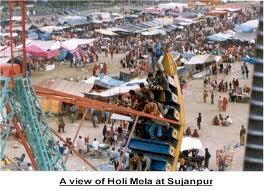 Throughout the year there are number of fairs dedicated to different seasons that are observed in Himachal Pradesh. Sair fair is one such fair that makes Himachal proud.One of the main attractions at the Sair fair is the traditional bull fight. The bull fight done here reflects too strongly on the Bull Fight in Athens. This event is organized at Arki in Solan. 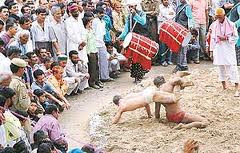 Although both the bull fights in Himachal Pradesh and in Athens are quite similar, one biggest distinguishing feature is the viewership. In Athens, common men are not allowed to view the event at all, while it is just the opposite inHimachal Pradesh. 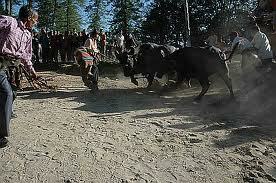 Festival of Himachal Pradesh often reminds one of the bull fights that took place in Athens. 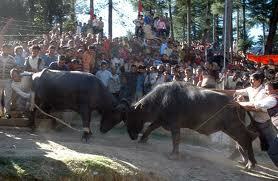 But in the Sair Festival in Shimla unlike in ancient Greece, the common men can watch the fight between the beasts. This bull fighting show is accessible to the visitors to the fair in lieu of a minimal expense. During the celebration of the Festival of Sair the local people dress in colorful costumes and put on expensive jewelry. But beside enjoying for themselves, the people visiting the fair do not forget to take home gifts bought for their near and dear friends and relatives. The Sair Festival in Shimla is a ground where old acquaintances get together and it is a meeting place for people coming from different religions and class. Apart form the famous bull fight, there are a number of interesting and entertaining events held during the Sair fair. Dance programs, Music performances, and many other forms of art are displayed by artists coming form far and wide to participate. A number of stalls and temporary shops are arranged for display and sale of handicrafts, pottery, utensils, garments, accessories etc.Localites of Shimla celebrate the festival with immense joy and fervor. Women and children can be seen dressed in beautiful jewellary, garments adding a spectrum of colors to the celebrations. Fairs and festivals are the perfect opportunity for people to come closer, buy gifts for loved ones, enjoy with friends and relatives, participate in activities, and witness cultural and traditional art forms and much more. The festivals and fairs of Himachal Pradesh are especially famous for their uniqueness and tradition specialties. Sair fair is one such fair that brings the festive spirit ofHimachal Pradesh to upfront.